Gichin Funakoshi is a legendary figure and the founder of Shotokan karate, the most popular style of Japanese karate, with millions of practitioners worldwide. In The Essence of Karate, Funakoshi creates, in his own words, a narrative of modern karate. 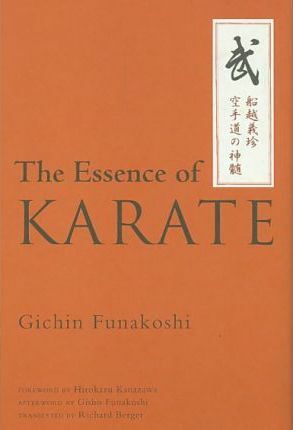 He explains the philosophical and spiritual underpinnings and includes memories of his own training, as well as recollections of other karate masters and the history of the martial art. He also discusses the importance of winning without fighting, and the reason why many great martial artists improve with age. The preface has been contributed by Hirokazu Kanazawa, President of the Shotokan Karate-do International Federation (and Funakoshi's disciple). He fondly writes of his memories of Gichin Funakoshi during his youth and what he learned from the master. In the afterword, the founder's great-nephew, Gisho Funakoshi, shares previously unknown personal anecdotes about his "Uncle Funakoshi." GICHIN FUNAKOSHI (1868-1957) was one of karate’s great masters. Born in Okinawa, the birthplace of karate, he began training in secret Okinawan martial arts as a child. In 1922, at the request of the Japanese government, he demonstrated the still-secret Okinawan arts of self-defense on the Japanese mainland, which led to karate's introduction to the rest of Japan and subsequently the rest of the world. Funakoshi devoted the remainder of his life to this traditional martial art and wrote several classics on the subject.